Cisco: Online video to account for 82% of all Internet traffic by 2021! Online video will make up 82% of internet traffic in 2021, according to a Cisco forecast released this week. The amount of bandwidth consumed will grow as more video is consumed and higher-quality videos are watched. Live (real time or linear) video is expected to see the fastest rate of growth over the next four years. Video accounted for 73% of traffic in 2016. Cord cutters generate twice as much internet traffic as those who still pay for regular TV, according to Cisco. The video bandwidth demand is coming from all types of internet video, including on-demand content like Netflix, web cam viewing and traditional TV options available over the internet (IP VoD). Live video is set to be the fastest growing segment of internet video traffic thanks to new video offerings like Facebook Live, Twitter’s broadcast of live sports and live over-the-top bundles from companies like AT&T, YouTube and Hulu. 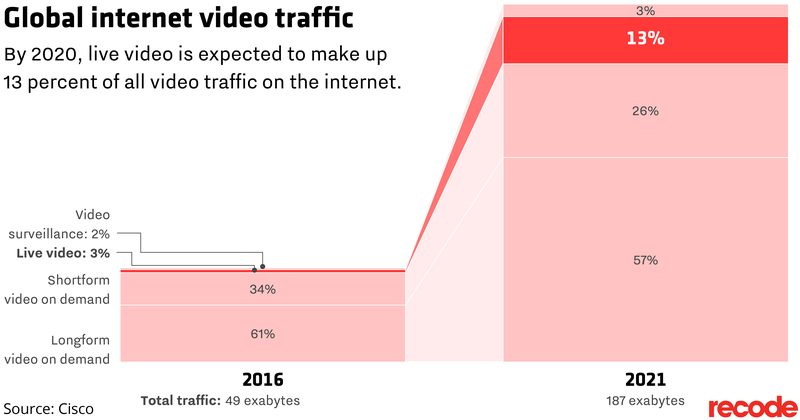 It’s expected to grow to nearly 25 exabytes (25 billion gigabytes), about 13 percent of internet video traffic, by 2021, up from 1.6 exabytes, or 3 percent of video traffic last year. Globally, IP traffic will grow 3-fold from 2016 to 2021, a compound annual growth rate of 24%. 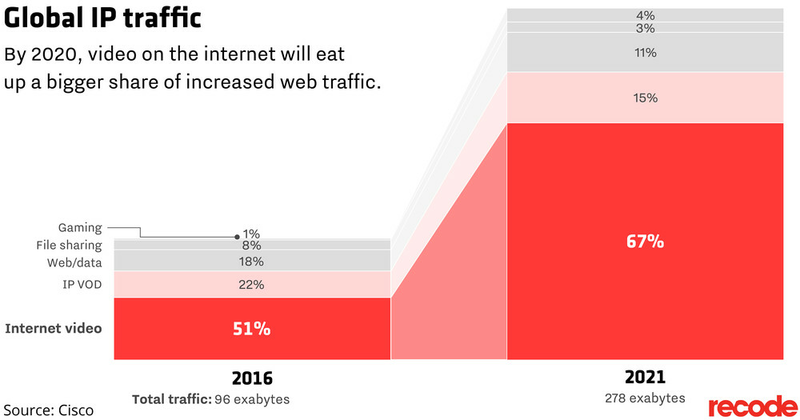 Globally, IP traffic will reach 278.1 Exabytes per month in 2021, up from 96.1 Exabytes per month in 2016. Global IP networks will carry 9.1 Exabytes per day in 2021, up from 3.2 Exabytes per day in 2016. Globally, IP traffic will reach an annual run rate of 3.3 Zettabytes in 2021, up from an annual run rate of 1.2 Zettabytes in 2016. Globally, IP traffic will reach 35 Gigabytes per capita in 2021, up from 13 Gigabytes per capita in 2016. Globally, average IP traffic will reach 847 Tbps in 2021, and busy hour traffic will reach 5.0 Pbps. In 2021, the gigabyte equivalent of all movies ever made will cross Global IP networks every 1 minutes. Cisco anticipate the balance of power shifting from mobile phones/tablets to IoT connected devices. By 2019, IoT connections will account for more mobile additions than smartphones, tablets, and PCs. And by 2021, 638 million IoT modules will be added, while smartphone, tablet and PC additions will reach 381 million. From a 5G perspective, there will be a slight impact over the next five years. The end of 2020 has been earmarked as the 5G finish line for a number of operators, though no-one should forget about 4G too quickly. Cisco predicts that by 2021, 5G will account for roughly 0.2% of mobile connections, though each connection will generate nearly 30 gigabytes per month, almost five times higher than the average 4G connection. These estimates would see 5G take 1.5% of the total traffic despite the modest number of connections. As you can probably imagine, a lot of this traffic will be video, in fact 80% of it will be. Video will dominate IP traffic and overall Internet traffic growth representing 80% of all Internet traffic by 2021, up from 67% in 2016. This means there will be 1.9 billion Internet video users by 2021, as well as three trillion internet video minutes per month, about one million video minutes every second. Video networking has been improved a lot after the invention of new technology to make mobile video extremely popular. Worldwide, Cisco is participating in the huge mobile video market via its Ultra Packet Core (UPC), which is the industry-leading, cloud-native converged mobile core. As evidenced by recent quarterly announcements by ACG Research, and by IHS Markit (formally Infonetics Research), Cisco is and has been the true leader in the Evolved Packet Core (EPC) market for several consecutive quarters. Their converged next-gen mobile core supports 5G, 4G, 3G, Wi-Fi, Small Cells, and IoT.